For further information about more than 1,500 companies cooperating with iba, please have a look at our website. 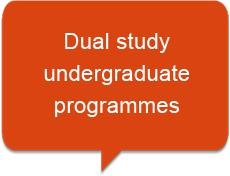 Our academic advisors will be glad to give you an overview of the entire portfolio and current job vacancies within the framework of our dual study programmes in a personal meeting. We can put you in contact with our cooperating companies or, of course, you can look for the company of your choice on your own initiative. The most distinctive feature is,without a doubt, the generalist education of our students. In the Human Resources (HR) department, for example, our students get to work in all areas related to modern personnel work: management & administration, HR marketing, recruitment, and people & organisational development. This way,we guarantee the best possible training and provide our students the space and opportunity to identify their own personal strengths within the different areas of work.